Daniel Joloba of Enterprise Uganda facilitates a training session on group leadership and governance (photo credit: ILRI/Brian Kawuma). 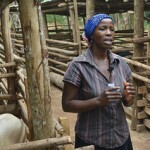 Pig production is a major source of livelihood to over 1.1 million households in Uganda. 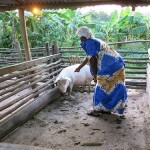 The pig is revered by many smallholder farmers because of its high productivity and lower capital and labour intensity as compared to other livestock species; most pig farmers highlight the ease with which the pig can be converted to cash to meet urgent domestic financial needs such as school fees and inputs for crop production. The numerous benefits of this enterprise notwithstanding, piggery continues to be looked down upon in most smallholder communities in Uganda. Pigs are commonly kept in the backyards, fed mainly on food scraps and farm residue and not considered as a business worth its salt. 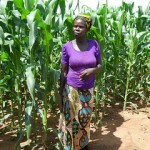 Worse still, many production and marketing challenges abound; farm inputs and services (like extension) are costly, feeds expensive and in many cases substandard, and markets unreliable. 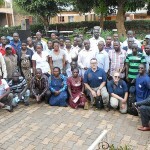 The Livestock and Fish pig value chain program in Uganda through the Irish Aid-funded MorePORK project is piloting a pig business hub model that is expected to enhance access of pig farmer to business development services as well as technical support to participating farmers. At the centre of the hub shall be collective marketing by farmers that will enable them to negotiate better prices for their pigs and an array of auxiliary farm input and service enterprises that they will be able to access on a check-off arrangement. To be able to optimize the benefit of this hub though, there ought to be a shift in the smallholder farmers’ knowledge, attitudes and practices regarding pig production to embrace this enterprise as a profitable business. Several business capacity gaps have been identified such as poor record keeping, financial planning and management. 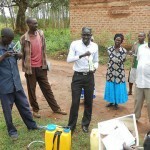 It is to this end that the MorePORK project has engaged Enterprise Uganda, a specialist in capacity building for small and medium enterprises (SMEs), to conduct a series of entrepreneurship and business management trainings that will benefit 150 pig farmers in Kabonera and Kyanamukaaka subcounties of Masaka District. Business linkage development between the Kyanamukaaka-Kabonera hub and any other interested pig processors and/or bulk buyers. The trainings are expected to catalyse the intensification of pig production by both individual farmers and the primary producer groups. Specific focus shall be placed on youth and women who will create a vibrant network of a new breed of highly motivated entrepreneurs ready to start and expand their agribusiness enterprises. These will collectively participate in the business activities of the hub and share in its benefits.